There were three notable chapters in my book this week, and I placed a bookmark on the page with the paragraph that wove them all together in a lovely way. Bookmark: I just finished devouring Douglas Thomas and John Seely Brown’s book, A New Culture of Learning: Cultivating the Imagination for a World of Constant Change. Change motivates and challenges. It makes clear when things are obsolete or have outlined their usefulness. Bot most of all, change forces us to learn differently. If the twentieth century was about creating a sense of stability to buttress again change and then trying to adapt to it, then the twenty-first century is about embracing change, not fighting it. Embracing change means looking forward to what will come next. It means viewing the future as a new set of possibilities, rather than something that forces us to adjust. It means making the most of living in a world of motion. Change – Thank you zacklur on Flickr for allowing this image to be used. The change I want to see is focused not on how content is delivered because content delivery is not learning (though this will surely be part of it), but in how we engage learners in processing that content, integrating it with their own learning and experience and other ideas from other sources, and making some sense of it all. I want to see changes in how we help our learners and ourselves develop our capabilities to be able to work and communicate effectively with others, to be creative in solving our world’s significant social and environmental challenges, to deeply value diversity and experience and wisdom, and to excel at critical self-reflection and ongoing learning. As I’ve written before, enough with the ivory tower that privileges obtaining certain kinds of knowledge and privileges who gets to obtain it. More and more, our non-ivory towers are doing this same thing, and not even realizing it. My biggest fear right now is actually not that higher education is changing; I fear that if we’re not careful with how it’s changing — not careful and super-intentional as we lead these changes — that more people, not fewer, will be shut out of significant, meaningful, transformative learning experiences. MOOCs might solve part of the access problem for delivering content and perhaps even being able to work through that content with others; MOOCs aren’t going to solve the access problem to significant, meaningful, transformative learning experiences. For one thing, MOOCs do not at all address the digital divide, which I believe is still an issue in our world. In the US, an undergraduate education used to be an option, one way to get into the middle class. Now it’s a hostage situation, required to avoid falling out of it. And if some of the hostages having trouble coming up with the ransom conclude that our current system is a completely terrible idea, then learning will come unbundled from the pursuit of a degree just as songs came unbundled from CDs. I think it’s ok if learning becomes unbundled from the pursuit of a degree if by offering degrees we are really only aiming for students just getting degrees. Unless we can focus on ensuring meaningful, engaging processes and experiences of learning, then why bother? I am as compelled by the piece of paper as I am by the archaic representations of learning such as seat time. I am thus also compelled to lead change in particular ways — with learning and access to it at the center of decision-making and innovation and resourcing — because I actually believe in the value of rearranging our sense of what’s possible. When we rearrange our sense of what’s possible, we can ensure that our students can, too. UC Berkeley campanile – aka, the Ivory Tower. Thanks lobotomy42 on Flickr for making this image available. • positive values (Hase & Kenyon, 2000; Kenyon & Hase, 2010; Gardner et al., 2007). 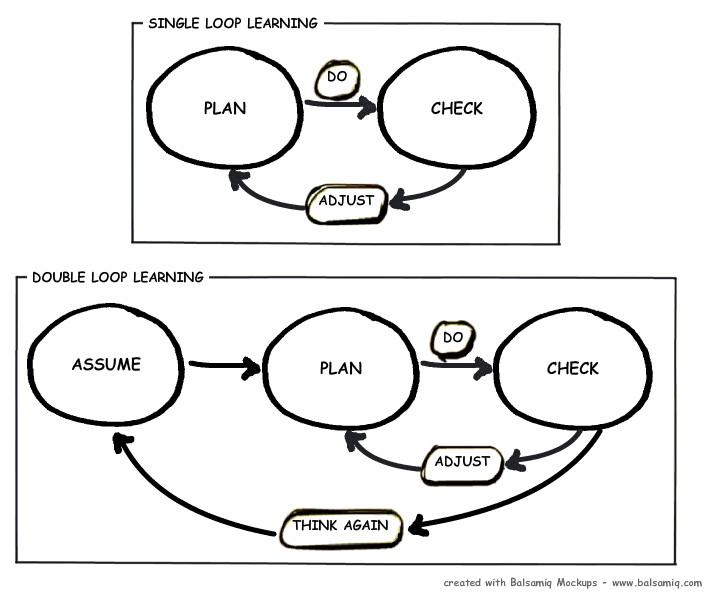 I look at double-loop learning as a a meta-assessment cycle that results in transformative learning; critical self-reflection and awareness are key features that allow the process to work (for individuals, and also for organizations). Would there be majors or programs of study that are content and discipline oriented? Or would it be truly interdisciplinary? Would we focus on pre-determined learning outcomes, or would they be emergent? Would knowledge be provided to or constructed by participants? Would there be courses? Or would learners and instructors get together differently? Or would they get together at all? Would we even have professors or instructors? How might their roles and responsibilities be different than now? Heck — would we have “students” as we know them? Be open — to new ideas and to new ways of doing learning work, so that it’s always evolving; and to all people, at low or no cost, so that everyone can participate, somehow. This is the kind of place or experience I’d like to create; this is the kind of place I’d like to be, and experience I’d like to participate in! For one thing, there’s no ivory tower there.